Fits: Most Celestron 8" (20 cm) f/10 SCT made in 2005 and later with black Phillips factory collimation screws that have metric threads. Includes SkyWatcher SCT and non-EdgeHD Fastar. 1. Most models with black Phillips factory collimation screws require metric knobs. A few post-2005 scopes have black Phillips collimation screws with standard threads. Here are some hints to help determine which screws your telescope has. Make sure the knob threads match the factory screw threads before installing the knobs. 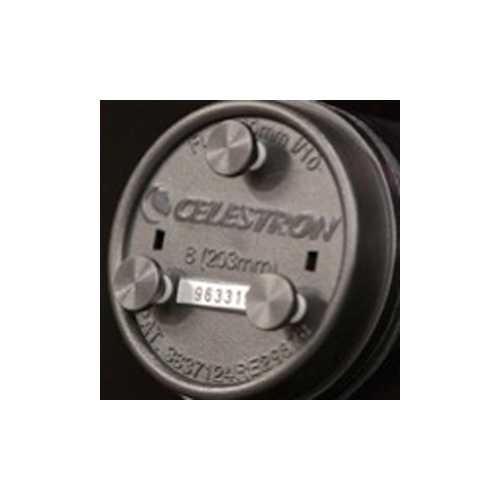 More information is in our Celestron Technical Paper. 2. These knobs will fit the metric Fastar version only if it does not have EdgeHD optics. Scopes with EdgeHD optics require different knobs (Item C8edg). 4. Some telescope versions have a small plastic cover over the factory collimation screws. This cover must be removed and set aside when Bob's Knobs are installed. The cover is cosmetic only and will not affect operation of the scope. 5.0 (Based on 3 Reviews) 100% of reviewers recommended this product. Cleaned my CPC 800 corrector plate and mirror, so a complete removal. Put the corrector plate back on and it was completely out of collimation of course. Installed Bob's Knobs, and was collimated in just a few minutes. Worked so well I just ordered a set for my 9.25 Edge. Tried collimating using stock Phillips head screws, very cumbersome. Bob's Knobs worked as advertised, quick and easy.